Treekart: Why don't you have a hobby of growing plants? First of its kind online plants store in INDIA. Why don't you have a hobby of growing plants? Do you all have hobbies right! yeah every one do.., like one has as hobby of listening to Music, playing Games, watching Movies, playing Sports and ..........this is a never ending list. 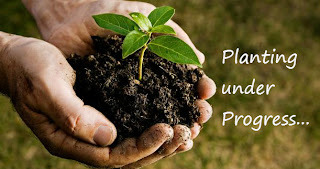 Have you ever thought planting a plant and watch it grow! why can't planting and gardening can be every one's hobby! Now a days the level of green house gases in our atmosphere is increasing rapidly which in return affecting in drastic climatic changes, have you ever thought your little contribution of having a hobby of growing plants in every one's mind will change the fate of THE EARTH. Yes it works,, really it do work. How?????? I know you got this question in you mind, instead of answering How? let us look into Why???? Do you how many people are migrating to Towns and Cities it is almost 85% of Villages present generations are living in Towns (or) Cities it means there is no hope that next generations will (or) will be living in Villages it reflect that after few generations no one will know how to plant a seed even, it is known fact that 90% of this blog viewers don't know how to plant. Isn't that true!!! It is your minimum concern of have commitment towards our "only and lonely planet". If you have the hobby of planting it will help your children for having a hobby like you, it is known fact that at least 1 out of 50 children gets their parents interests and almost every child will try to learn the lifestyle of their parents. It means that if you learn today you can teach tomorrow.Here in our blog we help you to learn growing plants and developing a hobby. Thanks for spending your valuable time for visiting out blog and read this post we hope to give our best to help you learn,, stay tuned for our future posts. "Hi viewers this is our first blog post from Treekart,we hope you did not got bored of this long post please leave feedback with your valuable comments below"